Speeding drivers is one of the primary concerns facing communities and municipalities around the country. With declining traffic safety stats, civic leaders may consider a number of solutions, including vertical, horizontal and digital technologies. While each of these can be both attractive and effective, vertical and horizontal options require construction, which is costly and disruptive. Only radar speed signs as a digital technology offer a scalable option that works within all budgets. These driver feedback signs are scientifically proven to be effective and can be installed quickly and used immediately. And because drivers, bicyclists, public transit and law enforcement like them, communities across the U.S. are using grant funds to add them to their overall traffic calming plan. Communities hoping to implement radar speed signs can run into challenges related to funding. When local municipal budgets can’t cover the cost, even the most well-planned efforts will face delays or cancellation. However, there are alternative funding sources that can close this gap, for example: federal and state government grants and corporate benevolent funds, including monies from nonprofit organizations. In December 2015, the Fixing America’s Surface Transportation (FAST) Act was signed into law. This law provides long-term federal funding for surface transportation infrastructure planning and investment. The FAST Act authorizes $305 billion over fiscal years 2016 through 2020 for highway, highway and motor vehicle safety, public transportation, motor carrier safety, hazardous materials safety, rail, and research, technology, and statistics programs. Consistent with other federal transportation funds, a significant portion of these funds are directed to and administered by each state’s department of transportation. As such, these state DOTs should be the first point of contact regarding federal funds. Below are three federal funding options that have been continuously funded and reauthorized year after year. The Section 402 program through the FAST Act provides grants to states to improve driver behavior and reduce deaths and injuries from motor vehicle-related crashes. It is jointly administered by the National Highway Traffic Safety Administration (NHTSA) and the Federal Highway Administration (FHWA) at the federal level and by the State Highway Safety Offices (SHSO) at the state level. Among other purposes, funds can be spent in accordance with national guidelines for programs to reduce speeding and improve pedestrian and bicycle safety. > Both of these objectives can be accomplished with driver feedback signs from Radarsign. To qualify for funding, states must submit an annual Highway Safety Plan (HSP) that must be data-driven and must set quantifiable, annual performance targets for 15 performance measures. > Radarsign StreetSmart traffic data reporting software can provide the quantifiable data required. The TIGER grant program, which is very competitive, supports multimodal and multijurisdictional projects that are difficult to fund through traditional federal programs. Funds can be used for programs to reduce injuries and deaths resulting from motor vehicles being driven in excess of posted speed limits. > Driver feedback signs from Radarsign are scientifically proven to reduce speeds, which also reduces injuries and deaths associated with speeding. a. Department of Transportation (DOT) intermittently offers project-specific funding. b. Department of Agriculture (USDA) offers Rural Development Grant Funds to communities meeting specific population and/or population density criteria. These monies can provide funding to improve roadways and community safety. There are a variety of state and county funding options available, often as part of a larger project. Many of these are associated with state DOT agencies. Separately, the Governors Highway Safety Association (GHSA) provides an excellent clickable listing of all state highway safety offices. Each office provides an online overview of the projects and funding sources with which it associates. To find out how your traffic calming project can fit into these, contact your state coordinator. > Complete Streets Program – Complete Streets is a voluntary policy (not federal legislation) that can be adopted by state and local governments. The policy encourages a focus on infrastructure and land use (new developments or reconstruction of old ones) to incorporate accommodations for walking, cycling and mass transit. While fewer than 20 states have adopted Complete Streets policies, many communities have voluntarily embraced the goals. In Massachusetts, Complete Streets funds contribute “toward the safety, health, economic viability and quality of life in a community by improving the pedestrian and vehicular environments. Providing safer, more accessible and comfortable means of travel between home, school, work, recreation and retail destinations helps promote more livable communities.” Radar speed signs support these goals. > Georgia Department of Transportation Local Maintenance and Improvement Grant (LMIG) – The city of East Point, Georgia, purchased two signs for a school zone in 2018. > Georgia Governor’s Highway Safety Highway Safety High Visibility Enforcement Grant awarded Snellville, Georgia, with a grant to purchase two signs in 2018. > Illinois Department of Agriculture Rural Development Grant awards up to $25,000 for traffic equipment. > Iowa special Traffic Enforcement Program (sTEP) – Lake City, Iowa used money from sTEP grant to purchase two signs in 2018. > Oregon Department of Public Safety Standards and Training (DPSST) – Creswell, Oregon, Sheriff’s department used grant monies from DPSST to purchase two signs in 2018. > The Tennessee Highway Safety Office (THSO) awarded the city of Tullahoma, Tennessee, the funding needed to purchase seven signs in 2014/2015. Historically, MUTCD compliance prevented the addition of any promotional signage on traffic signs, including radar speed signs. However, recently community leaders facing traffic calming problems and limited budgets have been looking at corporate sponsorships for funding. With these arrangements, a company purchases a radar speed sign and the city or county agrees to install and maintain it. A simple acknowledgement plaque is used to identify the sponsor. It is a creative funding option for local traffic calming when there are no state or federal roadways involved. BIDs are defined areas where businesses are required to pay an additional tax to fund development for improvement projects within the district’s boundaries. BIDs may go by other names: business improvement area (BIA), business revitalization zone (BRZ), community improvement district (CID), special services area (SSA) or special improvement district (SID). Funds are used to augment municipal government services to market the area for new business investment. This includes street development and improvements for pedestrian areas. Your local traffic problem may already be on the radar of a BID in your area, but a simple phone call can verify whether the project falls within its purview. As with all grant applications, a need must be documented with data that corroborates that need. Radarsign StreetSmart software helps secure grants in Waveland, Mississippi, by capturing data about speeding drivers. After a young woman in Waveland, Mississippi, was killed by a hit-and-run driver in an area with no sidewalks, the city launched a larger effort to make streets safer. The plan, which includes the installation of pedestrian-friendly sidewalks, is dependant on grant funding. Documenting the need for those funds—with data from driver speeds—was a driving factor behind the city’s purchase of a TC-400 from Radarsign. Here are some profiles of model communities that have successfully used grants and driver feedback signs to make their communities safer. Funds from the New York State Division of Criminal Justice Services were granted to the Town of North Hempstead to purchase radar speed signs. In 2016, North Hempstead worked with other nearby villages to organize a joint application to secure a $100,000 state grant to purchase 29 radar speed signs from Radarsign. The grant application solicited funding for signs that could be shared and rotated amongst 16 villages and unincorporated parts of North Hempstead. State Sen. Jack Martins (R-Old Westbury), secured the grant after he “heard from a number of communities” about speeding. “We went to the town and told them about our concerns and asked if they would coordinate for the entire town,” Martins said. The grant required the town to purchase traffic calming devices to serve the group of villages. Twenty-nine radar speed signs from Radarsign were purchased: 24 are portable and five can be permanently secured to poles or other structures. These signs will be shared amongst 16 villages and unincorporated parts of North Hempstead including: East Hills, East Williston, Flower Hill, Great Neck, Great Neck Plaza, Lake Success, Manorhaven, Mineola, New Hyde Park, Port Washington North, Roslyn, Roslyn Estates, Roslyn Harbor, Saddle Rock, Westbury, and Williston Park. “In a perfect world, it would be nice to have a police officer on every corner and enforcement the way that we’d like to see it happen,” said City Supervisor Judi Bosworth. “But these speed signs really serve as a wonderful deterrent. So it’s our hope that these signs, placed in the appropriate places where they could do the most good, will remind our drivers to slow down.” Bosworth’s assessment reflects that of a growing number of municipal leaders. The presence of a uniformed police officer is the most desired traffic calming solution, but tight budgets and personnel shortages often prohibit that scenario. Increasingly, law enforcement and city officials are turning to driver feedback signs to fill the gap when resources are limited. The long-term, documented success of radar speed signs is compelling. “These signs have been so successful in other areas, and we’re hoping that the Town of North Hempstead will see that success as well,” Bosworth said. In one study, the reduction in speeding drivers had consistently dropped by more than 25% two years after the installation of a radar sign. In a Bellevue, Washington study, the radar signs had not lost effectiveness even six to eight years after installation. This research gives decision-makers confidence that they can expect long-term benefits from their investment. North Hempstead saw such great success with the first 29 signs that the county purchased 18 more in 2017. Humboldt County in California secured funding through a special tax measure to support safety initiatives for law enforcement officers. The county was able to secure $60,000 to purchase 20 signs. Funds from AAA Minnesota/Iowa were granted to La Crescent Police Department. When La Crescent, Minnesota—a small town of 4,830 located south of Minneapolis along the Mississippi River—faced a speeding problem, Police Chief Doug Stavenau sought a solution that was affordable and qualified for grant funds. He found that in the TC-600 from Radarsign, which qualified for grant funding from AAA of Minnesota/Iowa. Radar speed signs from Radarsign can replicate vital traffic calming efforts for law enforcement agencies which make them especially attractive solutions for smaller towns on tighter budgets. A typical portable radar sign sold to law enforcement agencies costs about $3,300, or $275/month over a 12-month time period. The median salary for a police officer in the U.S. is $48,815/year or $4,068/month. This means that one of these signs—which typically operates 24/7, 365 days a year—would be monitoring and assisting in driver speed reductions for 8,760 hours each year, non-stop. One sign would see a COMPLETE return on investment in just 26 days ($3,300/$4,068 = 81.1% x 31 days = 25.2 days). With a complete return on investment in less than four weeks, the project, which required some municipal funding, received unanimous support from the city council. 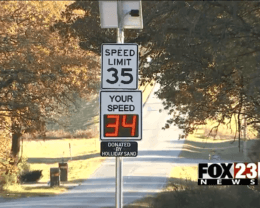 One Oklahoma company partnered with the county to address speeding concerns in their community. In Broken Arrow, Oklahoma, Holliday Sand and Gravel shares 129th East Avenue with residential neighborhoods, horse stables and bus stops. After fielding complaints that their gravel trucks were speeding, the sand and rock supply company partnered with the county to resolve residents’ safety concerns. With a focus on corporate responsibility, Holliday Sand donated a Radarsign TC-600 to Tulsa County.